Outgoing United States Ambassador Pamela Bridgewater said farewell to members of the press at a luncheon at the Ambassador’s residence in St. Andrew. Recounting an extremely busy three years of office in Jamaica, the Ambassador thanked the media for its coverage of the United States-supported events which ranged from training seminars, through engagement with communities to cultural exposes. 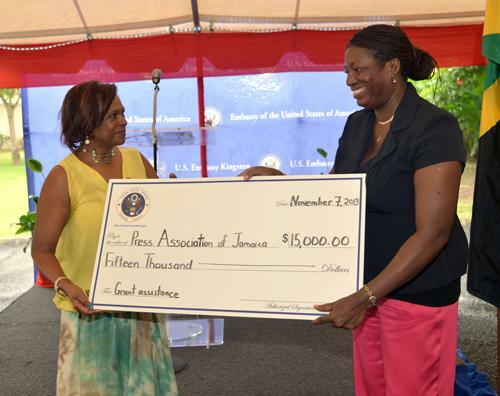 In expressing her appreciation to the Press Corp, Ambassador Bridgewater presented the PAJ with a gift of US$15,000 in support of the further development of its data centre at the organisation’s headquarters. PAJ president Jenni Campbell, thanked the Ambassador for her generosity. Ms. Campbell said the over 400 members of the PAJ are appreciative of the gift and will find the expansion of the data centre of tremendous benefit. The PAJ’s data centre was established to provide an off-site space for working journalists to conduct research and produce content for public consumption.